Exposure: 16 x 32 sec and 16 x 10 sec with Orion Skyglo for Luminance exposures; 16 x 16 sec R,G,B exposures. Processing: All exposures captured in K3CCDTools 2. Alignment and stacking was done with Registax 3 and saved as FITs. LRGB channels were co-registered in IRIS. Luminance and Color channels were scaled and rough color balanced in IRIS. The luminance exposures was constructed with the with the 32 sec exposure as the base exposure; the 10 sec exposure was combined to reduce star size on the brighter stars. LRGB channels were resized to 800x600. Final LRGB combine was done in Photoshop using Luminance Layering (or LLRGB). Color balancing and final touches were done in Photoshop (Blue halo subtraction and background noise subtraction). SGBNR (PixInsight LE) was used to smooth remaining background on the final result. Final image size is approximately 800x600. This image was a guided exposure. Melotte 71 is a medium rich open cluster - it is also an older cluster with some reddish stars. 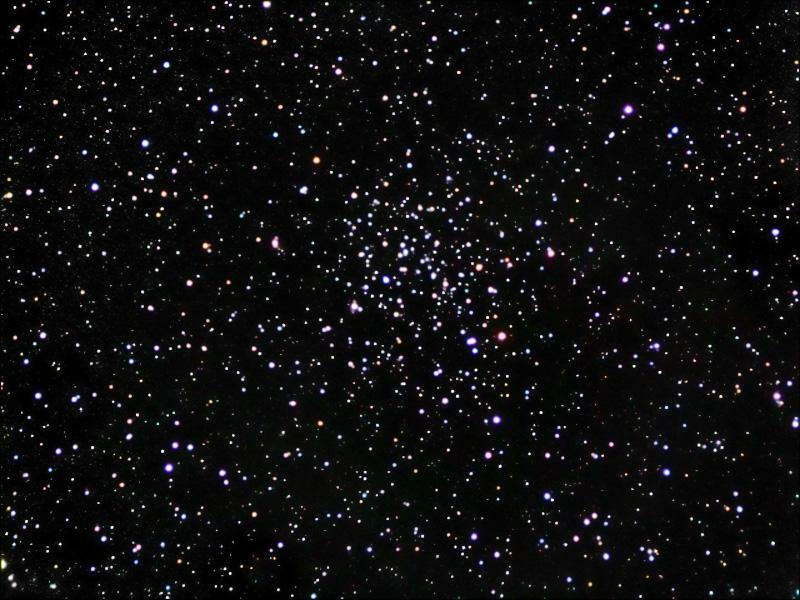 This cluster is in Puppis right next to the Monoceros border and just about 2-1/2 degrees North of the M46 / M47 area. Horizontal FOV is about 30'. Image center is at Equatorial 2000: RA: 07h 37m 39s Dec: -12°05'18"